In this tutorial, you’ll be shown how to manipulate a static car to become one that looks like it is realistically speeding. First of all, we will need to understand the concept of lighting and reflection that will take place when a car is moving swiftly on the road at night. This tutorial focuses on how to apply the combination of layer mask and blending mode functions. The final outcome should be of a painted sports car driving rapidly at night. First and foremost, you will need to visualize the end effect and result of your image. Though some users might think that a good art work is all about Photoshop skills and techniques, I personally believe that to create a piece of good illustration, the artist or designer must first understand and grasp the concept of the theme they are planning to create. They need to be clear of the style they wish to apply to their illustration, which includes the idea, perspective and characteristic. It is crucial to improve one’s manipulation skills and art sense if they ever wish to produce a successful piece of work. To begin with, choose two similar perspective images as an element of illustration. I have chosen a sports car and a night scene image for this tutorial. Use the Pen Tool (press P) to create an outline of the sports car. Press Clrt+Click to make a selection of the outline in Path Layer, then cut this object and paste it to the background image. Move the copied sports car to the position you want in the background image and make sure the perspective is accurate before moving on. Use the Transform Tool (Ctrl+T) and Warp Tool to help transform the direction of the car. Once you are satisfied with the angle and placement, proceed to the next step. This sports car image contain reflections which are not realistic or suitable for the current background. Use a Clone Stamp Tool (press S) to remove the unnecessary. Normally, we will find reflection of the surrounding environment casted on the car chassis. There is a simple way to transfer those reflection. Simply duplicate (Ctrl+J) the background layer and flip (go to Edit > Transform > Flip Vertical) it to the position you wish to see reflected on the vehicle. Change the “Background 2” layer mode to Overlay but maintain its Opacity to 100%. After that, create a clipping mask between “Background 2” and “reflection” (press Alt + click the centre of these two layers in Layers Window). As the car reflection is too strong, I’ve decided to duplicate another layer and reduce its Opacity to 38% to soften the effect. Combine all layers (except the original background layer) before moving on to the speeding effect. Go to Filter > Blur > Motion Blur. Although my setting is Angle: 16 and Distance: 79 pixels, you can always set the amount base on your preferences. When I’ve completed the blur effect, I set this “motion blur” layer Opacity to 59%. Only when you think the overall speeding effect is realistic should you use the Blur Tool (press R) to touch up the edges of the car to make it look livelier. Otherwise, use the motion blur filter again for further modifications. The following step is to make the wheels rotate. We need to do a two-times blur for the wheel. One is for the sport rims and another for the tyre. Using the Pen Tool again, make a selection on the sport rim. Go to Filter > Blur > Radial Blur to create the wheel moving effect. When finished, repeat the same steps for tyre (you might need to mask out certain parts in order to gain the best effect). Repeat the same steps for the other wheel. It’s time we create headlights for the vehicle. It’s very simple. Just go to Filter > Render > Lens Flare. I prefer a 105mm Prime Lens and brightness amount to 85%. In this tutorial, I’ve tried using two different lens types and I’ve discovered that the lighting effect is pretty good. Some users might be doubtful about the flare effects at the front of the sports car but do not worry, it can be solved in step 10. Next, use the Lasso Tool (press L) to draw a shadow on the tarmac. Use Feather (go toSelect > Modify > Feather Selection) to soften the edges of the selection and fill in with Black. Go to Filter > Blur > Motion Blur to create a direction for the shadow itself. After that, change the blending modes to Multiply and set Opacity to 76%. Please re-modify the shape of the shadow if you are not satisfied before proceeding to the next step. This is simply because we are going to flatten the image and it will be hard to adjust once we have combined the layers. We will now solve the flare problem mentioned in Step 8 and at the same time create a very cool illustration effect on the vehicle. Go to Filter > Stylize > Glowing Edges. My setting is Edge Width: 2 , Edge Brightness: 6 , Smoothness: 5. Change this layer mode to Overlay and set Opacity to 50%. This effect will create a fantastic illustration style and make the whole sports car look even more solid and shinning. Apply the same concept on the background to make the art work more complete and “unified”. First, duplicate the “Background” layers and change the effect to Glowing Edges(go to Filter > Stylize > Glowing Edges). Rename it as “glowing edge” and set this layer to Overlay mode and Opacity: 45%. In the next step, merge (select two layers in Layers Window and press Ctrl + E) this two layers together, name it “glowing edge copy” and change the Opacity to 36%. Duplicate another “Background” layer, move this to the top and set Opacity to 80% to lighten the background. 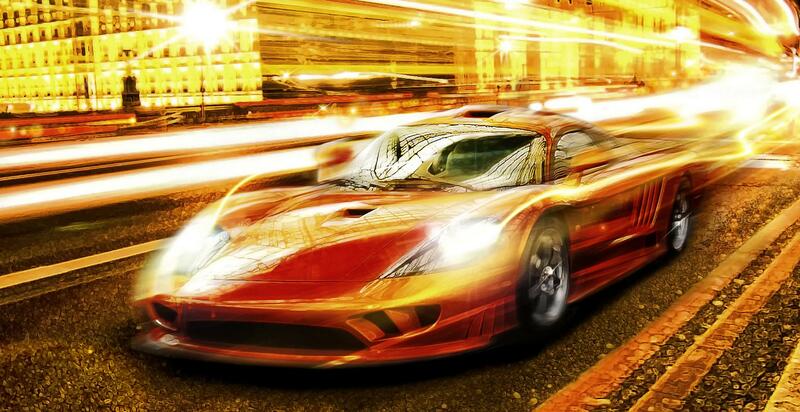 We have finally created an illustration of a sports car moving rapidly and swiftly on the road at night. Apart from that, we can further enhance the section highlighted in blue to get better results. I would suggest you repaint some of the darker areas and bring out the highlight points in the whole illustration. You can also adjust the contrast and brightness of the image to your own liking and add some striking lines to express the dramatic speeding effect. That’s all I would like to share with everyone. 1.Always duplicate and keep a layer of work you have created. If there are any layers that we are not satisfied with, you’ll be glad that there are still room for re-modification without causing too much problem nor consuming too much time. 2.We can always change the blending mode or opacity in later stage to improve the effect and to enhance the material of the object. Feel free to set your own level of setting because it should all depend on the different situations and styles you have in mind.